Diets, mindful eating, and managing bad tendencies with food are the topics of this episode, whose returning guest is Dr. Roberto Olivardia, a clinical instructor of psychology at Harvard. In the field of eating disorders for twenty years, Dr. Olivardia discusses links to ADHD alongside stories and experiences of managing diet, food groups, and the necessity of being mindful of one’s eating habits. Host Eric Tivers and Dr. Olivardia also mention exercise and how it can relate to diet. 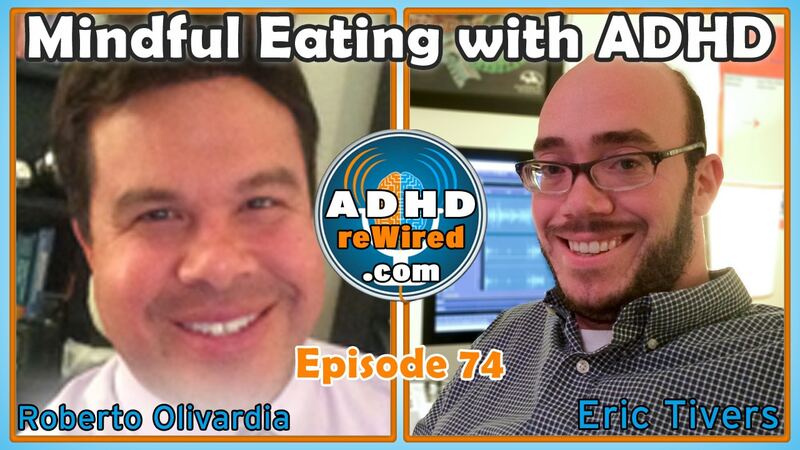 Dr. Olivardia was a guest previously on episode 37 of ADHD reWired where he discussed the effects ADHD can have on sleep. Located in Boston, Dr. Olivardia, who has ADHD himself, is a clinical instructor of psychology at Harvard Medical School; clinical associate at McLean Hospital; maintains a private clinical psychotherapy practice specializing in treatment of ADHD, BDD, OCD, eating disorders in boys and men; co-authored the book The Adonis Complex, detailing various issues of body image in males; and has been published in or appeared in Time magazine, GQ, Rolling Stone, Good Morning America, Extra, CBS, CNN, Fox and Friends, and VH1. Inspired by some of his previous conversations with Roberto, Eric decided to take Mondays off during the month of July to spend more time with his son. Roberto would occasionally take Fridays off throughout the year to spend time with his kids when they were younger. Later on, he figured that because of the added schedule flexibility most have during the summers, that he could take off Mondays. Roberto has worked in the field of eating disorders now for the past twenty years. Particularly in cases involving those with binge eating disorder, bulimia, obesity, or compulsive eating issues, Roberto noticed that many of them had undiagnosed ADHD. Many of those with undiagnosed ADHD had previously received treatment for their eating disorders, only to be labeled as “treatment resistant” or not trying hard enough. Acknowledging the ADHD is fundamental. In 2008 Roberto spoke at that year’s CHADD conference about the relationship between eating disorders and ADHD. Roberto: Literature published about gastric bypass patients shows that up to 40% of them have ADHD, the majority of those individuals being undiagnosed at the time of the procedure. Those with ADHD are more likely to gain weight back after such a surgery. People with ADHD tend to crave sugar. The brains of those with ADHD metabolize sugar more slowly than of those without, meaning they can potentially ingest a lot more sugar before their feeling a mental warning. Thinking back to graduate school, Roberto remembers encountering the Dunkin’ Donuts Strawberry Coolatta, essentially a strawberry-flavored sugar slushy drink. He had two of them within a short period. Upon trying the drink, Roberto’s wife, who does not have ADHD, winced at how sweet it was. When Roberto began drinking coffee in his early thirties, he would add tons of sugar; when he was younger and his parents wouldn’t let him drink soda at home, he would visit a friend’s house to have it instead – he loved it. Now, with knowledge from the studies he’s read paired with a responsible diet and exercise, Roberto knows to be careful about sugar. Reading work published about food and ADHD, Eric found that it requires more neural energy for those with ADHD to break down carbohydrates. Eric’s morning routine used to include three large cups of coffee and a healthy cereal. He would fall asleep soon afterward, however. Upon trying a low-carbohydrate, higher protein diet in the morning, Eric noticed a difference almost immediately. He’s been making the same protein shake in the morning virtually ever since. Roberto: Sugar is the primary ingredient those with ADHD have to watch out for (which includes simple carbohydrates like white bread) the most. Protein is almost the opposite to sugar; studies are now showing that those with ADHD really need protein. Since he was six years old, Roberto says he noticed he would become irritable if he didn’t have enough protein. Eggs, almonds, peanut butter, meats, etc. are all recommended. At the suggestion of his brother, Eric recently switched from using regular peanut butter in his protein shake to using peanut butter powder instead. It contains the same amount of protein, but lacks much of the fat and sugar present in the regular butter. Many will enter into a mentality of depriving themselves of certain foods, usually by splitting food into categories of good and bad. If you lose too much weight too quickly, your body and mind will attempt to compensate and rebound back to where it was, if not to a heavier state. The safe pace for weight loss is about a maximum of two pounds per month for men and one pound per month for women. Eric: In some ways, that can sound good – it seems a lot more approachable of a goal to lose a smaller amount per month rather than a large amount in a short period of time. Looking back, Roberto feels the key to successful diet is moderation. Roberto: If I like a certain food, I’m going to eat it. If I want a cookie, I’ll take a cookie. But, I know better – I can’t have a full package of Oreos in my house. I’ll buy the package of six, and if I’m in the mood for them, I’ll have them. The key is really being mindful of what you’re eating. A person practicing good mindful eating should be assessing what they eat almost as if they had to provide in a full report to a doctor what, when, how much, and why they are eating. Regardless of their diagnosis, when Roberto meets with people, he asks them about their sleep and their diet – do they eat breakfast, lunch, and dinner; when do they eat; how much to they eat. At the beginning, being mindful of your eating requires a lot of effort, but it will eventually become a routine. Those with ADHD tend to be fast eaters, readying their forks with a new bite outside their mouths while chewing. Simple technique changes, like placing one’s fork on the table in between finishing bites of food, can help to manage over-eating. The first time Roberto went to a buffet, by the time it was time to leave, he felt couldn’t leave the booth for fear of throwing up from eating so much. Roberto: Lots of people don’t have to think twice. Many people with ADHD do. We have to have a plan. We have to be effortful, because the alternative is either massive weight gain or just no longer enjoying your food. Eric: One approach to mindful eating can be to try to notice each and every detail of the experience of eating, such as the feeling of a fork puncturing a piece of food, the feeling of the food on your lips before you eat it, the food’s texture in your mouth before you eat it, its smell, etc. I think it creates more enjoyment of the food anyway. When we slow down our eating, we will eat less over time. In the book Mindless Eating, Roberto found that if someone is given a smaller portion of pasta in a smaller bowl without the opportunity for more, they’re more likely to eat that portion slowly and be satisfied with it. On the flipside, people given four times the amount of pasta in a larger bowl and told to eat half of it still felt hungry and deprived of the second half. Sometimes, when eating out at a place Roberto knows has large portion sizes, he will ask them right away to wrap up half of the meal without showing it to him; if he sees it, it’s very difficult to remember how full he is at the time. Eric had the worst stomach ache he’s ever had in his life one Father’s Day after brunch, a lot of extra mandel bread, and too much dinner. Eric and his wife, when visiting somewhere at which they have the potential to overeat, will sometimes plan out ahead of time an idea of how much they want to eat. People rarely realize how many calories and how much fat is in a lot of the food we eat, especially in restaurants. To maintain a healthy weight, watching what you eat is absolutely primary. Eating snack foods can quickly counteract the effects of a one-hour workout. A cousin in the food industry told Roberto that one high-end steak restaurant would use an entire stick of butter on one steak. Eric mentions recently buying an ElliptiGO, a cross between a bicycle and elliptical trainer. For people with ADHD in particular, their executive functions become “polished: when they exercise. A lot of brain research shows that exercise stimulates white brain matter growth to help make neural connections. Strict gym workouts might not be best for those with ADHD; find something you like to do and do it as long as it involves movement. One of Roberto’s recent patients was struggling with gym visits. He switched to jump-roping for twenty minutes per day at a park nearby his home; he really enjoys it and is receiving great results. The hope is that as you workout more, you’ll convince yourself to not have your effort go to waste by later eating unhealthy foods. Eric will periodically check his heart rate while working out as a way to make sure he’s maintaining the right level of intensity. Without exercise, Eric is much less productive. A ten-minute run or jumping jacks in between meeting with clients helps him a lot. Medication, sleep, and exercise are Eric’s trifecta of ADHD management. Every patient Roberto has helped deal with both an eating disorder and a drug addiction, because of the necessity of eating and managing food on a daily basis, has said that the eating disorder was harder to overcome. Roberto accepts that he has to be aware of these different elements in a way than many others do not. Our bodies can work with us if we treat them well, or against us if we treat them poorly. Children now are more obese than ever before. For parents, it’s that much more important to be a model of healthy and responsible eating to their children.